Do you think that all the work is done after the paper is published each day? Not in the Accounting department! Even before they prepare and send out the bills, they do the laborious process that is called “paper checking”. Someone there takes copies of the paper and a billing manifest and compares the two for exceptions. These might be ads that are missing, unordered, mis-sized, misplaced, misprinted, etc. These error conditions are greatly reduced by using a tool like Layout-8000™. However what Layout designs might not end up being what’s published. One source of conflicts is that ads can be moved, inserted or deleted during news pagination. Another source of conflicts might be loss of color on an ad ordered as color. Of course ads sold for premium positions that aren’t satisfied are other candidates for makegoods. 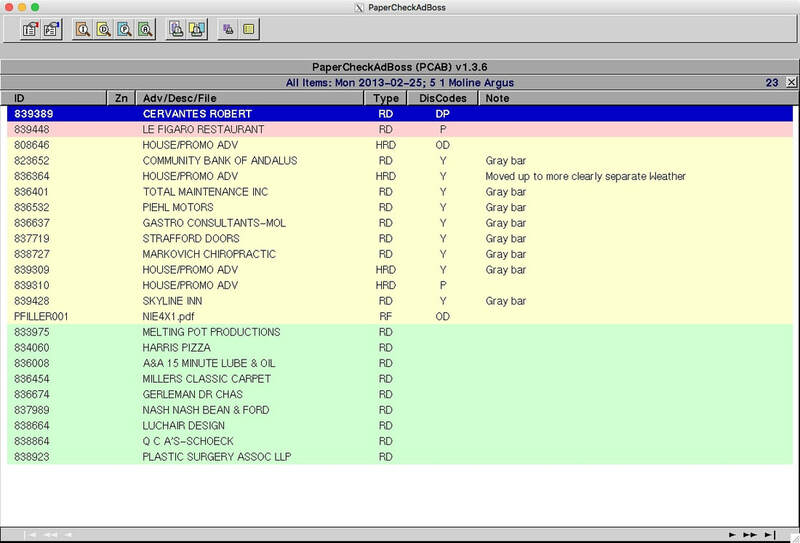 Thorough paper checking at a mid market daily newspaper may be a task for one or more full time equivalents (FTEs), but with PaperCheckAdBoss™ (PCAB) this can be reduced to about 10 minutes (a minute or two of processing, plus a few minutes of reviewing the results). Going from order entry, through dummying and pagination have well understood and perfected data and work flows. You go from front to back. But paper checking is about auditing. Auditing goes from back to front, verifying each step. Disparate data sources and staff activities must be validated. If the steps don’t run well in reverse, then the verification process becomes a labor intensive and error prone task. It can be a real mess. It is complicated by the cross departmental nature of the task. It is exacerbated by the requirements to produce accurate position manifests for tearsheet systems. If you don't do any type of paper checking, you risk REALLY annoying your advertisers (first you made an error with their ad and then you billed them for it anyway). You also risk not being in compliance with Sarbanes-Oxley requirements to be able to verify every figure that appears in your reports to stockholders. PCAB checks all of the following types of ads: Retail Display, Obits, Classified Display, Liners, Legals, House Retail, House Classified, Fillers, Child Display and Digital. PCAB does all this by gathering and comparing the many relevant production files, which provide very accurate position and size information. For one physical product at a complex site, there might be two or three Layout sessions, two or three classified pagination sessions, 40 to 50 news pagination documents and page images, and hundreds of ad images! With PCAB, it all comes together very cleanly. PCAB presents its results in two ways: in a concise list with problem ads in red and yellow at the top, and OK ads at the bottom in green (below right); or more graphically, with side-by-side dummied and paginated pages (below left). Both communicate the verification issues at a glance. Discrepancies between the paginated ads and the manifest are noted for additional follow-up. PCAB can currently detect 16 types of discrepancy in five categories: Missing Ad Discrepancies, Zone and Page Discrepancies, Position Discrepancies, Size Discrepancies and Other Miscellaneous Discrepancies. In addition, PCAB helps compute for you the actual Advertising Percentage (which is expected to be accurate to two decimal places!) for United States Postal Service Form 3541. Order entry systems can often compute the total column-inches for ordered ads, and Layout-8000 can compute the percentage for dummied display ads. 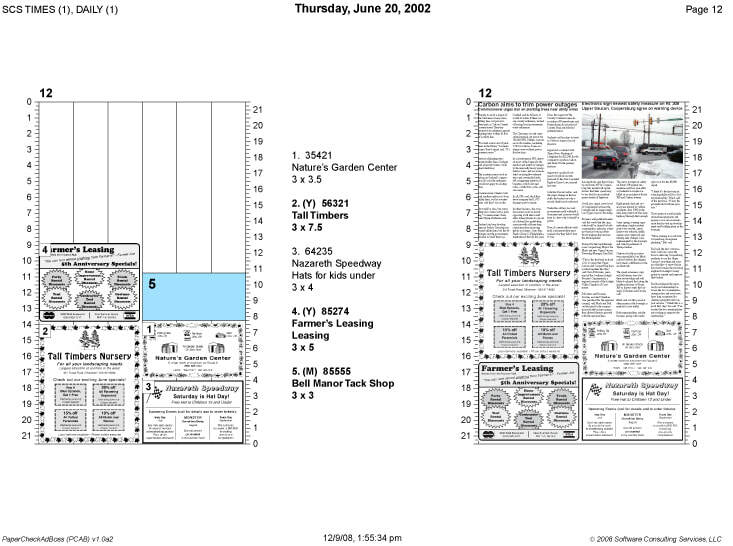 But only PCAB (or manual checking) can provide the FINAL sizes of ALL ads and fillers that ACTUALLY appear in the printed newspaper. New ad types are being added as they are encountered. SCS provides world-class support for PCAB (as well as with our many other applications). New releases with significant enhancements are provided regularly through agile incremental development practices. Would you like to try running PCAB at your newspaper? Download the﻿ Test Data document ﻿to learn what files SCS needs to get started.